Are you looking to continue your studies when you leave school while training and playing football, representing Chesterfield FC? If so, there is an opportunity to study with Chesterfield FC Community Trust in 2018! Chesterfield FC Community Trust’s Football and Education programme is designed for individuals wanting to gain post-16 sports qualifications and play competitive football, alongside studying. Students will develop the necessary skills, qualities and characteristics that are required to work within a professional football club or national governing body and gain transferable skills relevant across the sports industry and beyond. Delivered in partnership with Outwood Academy Newbold, students will study full-time within the sixth form, where a top-class education programme will be assured, with the school’s motto ‘Students First’ at the heart of everything they do. Alongside their education, students will represent Chesterfield FC, competing in a league against other professional clubs and training on a daily basis with the Trust’s FA/UEFA-qualified coaches. There will be an opportunity to play against other clubs, including Birmingham City, Burnley, Crystal Palace, Derby County and Sunderland! Students will undertake 14 units of work including coursework and exam assessments over a two-year period. The course is full-time with students required to attend all lessons and complete work on time in order to play in the fixtures and represent Chesterfield FC. 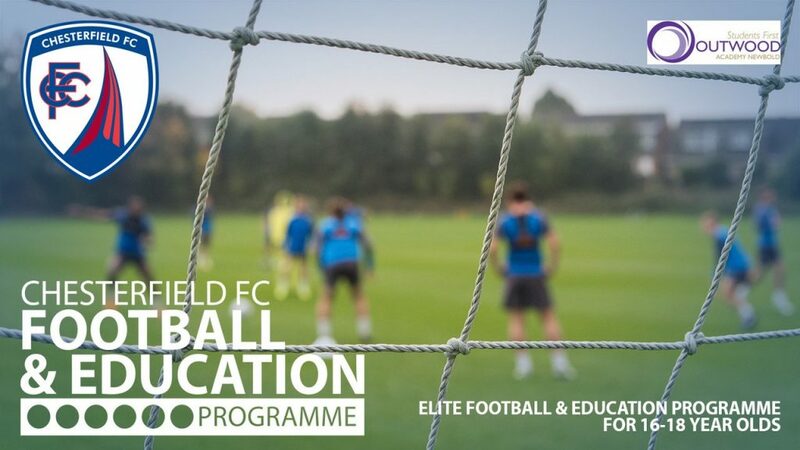 Upon completion, the course is equivalent to three A-levels, enabling the students to progress on to university, higher education or a foundation degree with Chesterfield FC Community Trust. All studies will be based at Outwood Academy Newbold, using the state-of-the-art classrooms that the school has on site. Training sessions will take place at Outwood Academy Newbold, using the grass and astroturf pitches available on site. Home games will be played at Glapwell Stadium, allowing the students to experience playing within a stadium environment and students will have free access to the gym and hydrotherapy pool at the HUB at the Proact Stadium seven days a week, as well as access to a physio. Upon completion of the course, students will be faced with a range of options, supporting them to have a future within the sports industry. Dependant on final grades, students will be able to go into higher education at university where ideal courses may include a degree in Sports Development, Sports Coaching or PE and School Sport. Should students wish to stay involved in the professional football club environment, Chesterfield FC Community Trust offer a foundation degree, where students can study for a further two years whilst completing a full-time work placement within the football club. Steve Roberts, principal at Outwood Academy Newbold, expressed his delight at the partnership, saying: “I’m absolutely delighted. It’s an opportunity for us to partner with Chesterfield Football Club Community Trust and provide students with an opportunity to do BTEC Level 3 Sports. “That will actually help students who might want to progress to university and it gives people an opportunity to go out and be involved with football as an industry, behind the scenes roles or maybe progress onto something like sports and exercise science. “It gives them that opportunity and more importantly it gives them the level of qualification to get on to the next step. Trust chief John Croot added: “The Football and Education Programme is something that we have been discussing with Steve and his team for a couple of months now. “It’s taken us some time to get to this stage but we wanted to make sure that the course we were offering was of top quality, in order to fulfil our duties to the students. Please complete the form below if you are interested in applying.